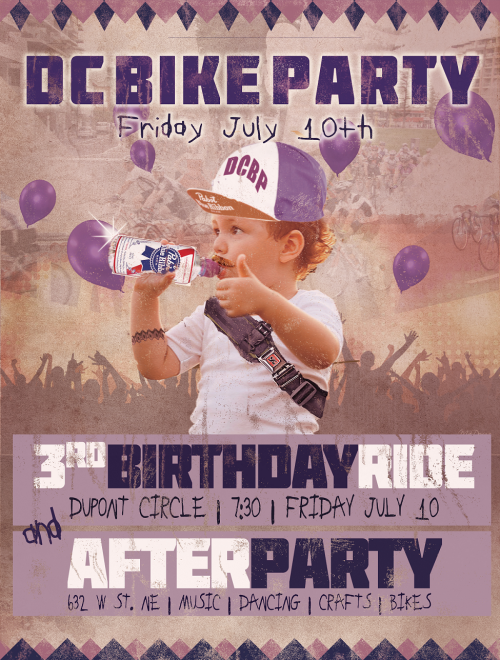 “DC Bike Party, will celebrate its third anniversary with a special Friday edition as well as an after party at the City Bikes warehouse at 632 W St. NE. On July 10th, the popular monthly party ride, which averages between 700-1,000 participants each event, will ride through DC all set for a birthday party. Bikes will be adorned with balloons, birthday cakes, and streamers! DC Bike Party’s amazing mobile jukebox will be cruising along the ride to provide the tunes for the evening as well. Riders of all levels are welcome. The group, departing from Dupont Circle at 8pm sharp, will set out to complete an approximately 7-mile ride, breaking for a pit-stop performance by Urban Artistry at Benjamin Banneker Park, before ending with an after party at 632 W St. NE. The after party, which starts at 9:30pm and ends at 1:00am, will have a full bar, ice cream from Milk Cult, bike portraits, a large communal mural, water balloon fight and live music by The Originators. A map of the complete route will be available at DCBikeParty.com 24 hours before the ride. Riders are welcome to join or depart the group at any point—many riders use Capital Bikeshare. Everyone is welcome to attend the party or participate in the ride. RSVP on Facebook using this link.